I’m a sucker for a major 7th chord. I’m not great on my music theory, and I’m sure somebody could probably explain what it is about the sound of a major 7th that makes me feel that way. All I know is that I love the sound of these chords. In any key. So it was no great surprise when I started digging out the chords to this song to realise it was full of major 7ths. 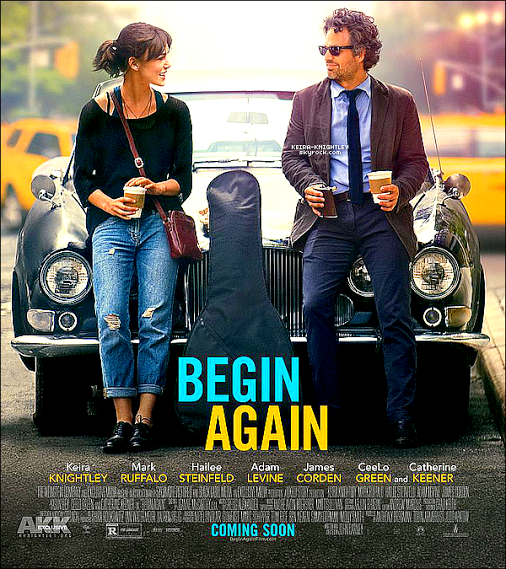 Lost Stars is from the movie Begin Again, a comedy/drama about a singer-songwriter who is discovered by a struggling record label executive and collaborates with him to produce an album recorded in public locations across New York. Featuring the acting talent of Kiera Knightly, Mark Ruffalo, Adam Levine, Hailee Steinfield, James Corden and CeeLo Green, the other true star of this film is the soundtrack. And in that came another surprise. For the soundtrack is largely the responsibility of one Gregg Alexander. Now that might not exactly be a household name, but for those in the know this is a huge deal. For Gregg was the force behind the band New Radicals. In many people’s eyes, New Radicals were a one-hit wonder known only for their mega-hit You Get What You Give. But the album that song came from, Maybe You’ve Been Brainwashed Too, is a stone-cold classic, one of my all-time favourites, and is similarly rated by many who know it. Yet almost as soon as the band became successful, Gregg broke up the band. In fact it appears that the success, and the implications of that, were in fact the catalyts for the break-up, Alexander realising that the life of a touring, promoting band was not what he wanted, and what he really wanted to do was focus on song writing. There was some evidence of that subsequently, including songs for Ronan Keating (particularly Life Is A Rollercoaster) and Sophie Ellis-Baxter (Murder On The Dancefloor), but – at least as far as I was concerned – Alexander fell off the map. So imagine my surprise when I discovered (how, I can’t quite remember) that he had resurfaced again, mainly as a writer, for Begin Again. Listening to the soundtrack album it is obvious, really. You can just imagine this as a New Radicals album, and the fact that is mainly led vocally by Adam Levine (Maroon 5) and Kiera Knightley doesn’t alter that. The whole sound and vibe is, for me, a direct follow-through from Maybe You’ve Been Brainwashed Too. So to the song. The film features this a number of times, including a simple and sparse version sung by Kiera Knightley, and there is also an acoustic version by Adam Levine (accompanied, I think, by Greg Alexander). But this (below) is probably the definitive version. And the song sheet? Well again, there is nothing too tricky here, although when singing it you might need to avoid the high falsetto vocals of Levine and bring it down an octave (I know I did, particularly on the “I thought I saw you out there crying” bridge bit!) – the Kiera Knightley version is a useful guide in that respect. On the song sheet you’ll see I’ve put the C, D and Dm chords as barre chords on the 3rd and 5th frets – I personally prefer the sound of this, but you can substitute with standard versions of those chords if you want. And clearly there’s lots of that yummy Fmaj7 chord sprinkled liberally throughout the song. There are also quite a few ukulele versions of this online (just search for Lost Stars ukulele in YouTube), although this wonderful instrumental version is a definite stand-out – way-beyond my capabilities, though. Enjoy! Categories: Pop | Tags: 2000s, 2014, Adam Levine, Gregg Alexander, Kiera Knightley, New Radicals, Pop, ukulele | Permalink.